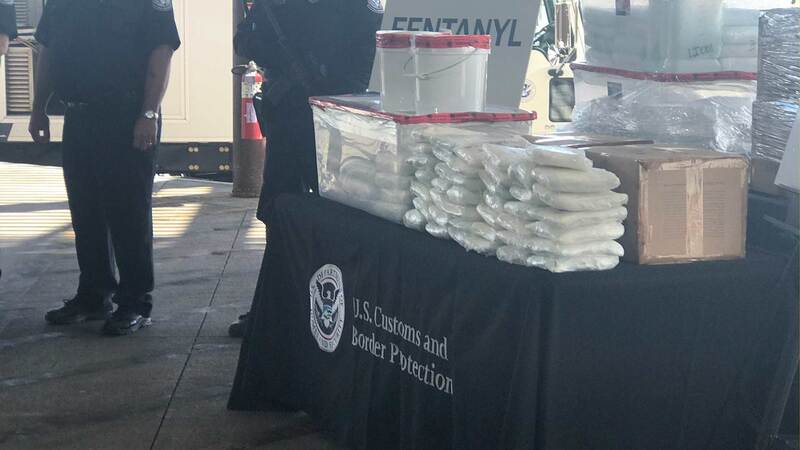 / Modified feb 1, 2019 11:46 a.m.
Customs and Border Protection displays the largest fentanyl seizure in agency history, at the Nogales Port of Entry, Jan. 31, 2019. PHOENIX — U.S. Customs and Border Protection officials announced Thursday their biggest fentanyl bust ever, saying they captured nearly 254 pounds of the synthetic drug that is fueling a national epidemic of fatal opioid overdoses from a secret compartment inside a load of Mexican produce heading into Arizona. Most of the seized fentanyl with an overall street value of about $3.5 million was in white powder form, but about 2 pounds of it was contained in pills. Agents also seized nearly 395 pounds of methamphetamine, with a street value of $1.18 million, Humphries said.